The Canned Goods section for entries includes: canned goods, jams, jellies, preserves, pickles and relishes. Under this category the following are accepted: whole tomatoes, tomato juice, soup mixture, corn, beets, green beans, applesauce, apples, apple butter, salsa sauce, apple jelly, grape jelly, blackberry jelly, citrus marmalade, peach preserves, strawberry preserves, peach jam, blackberry jam, cherry jam, strawberry jam, beet pickle, bread and butter pickle, sweet cucumber pickle, dill pickles, watermelon pickle, corn relish and hot peppers. The Crafts section covers entries for Adults (18 years old and up). This section includes: scrap booking, framed art (watercolor, drawing or acrylic on paper, not to exceed 16” x 20”), framed art (acrylic or oil on canvas or board, not to exceed 16” x 20”), bottle craft, ceramic of any type, woodwork, metal craft, leather craft, decorated basket, article of loom weaving, painted tote bag, painted furniture, handmade lamp, braided rug, hooked rug, stained glass art, sweatshirt design, hand painted article, trash to treasure and any other item not mentioned. Also included is the Christmas Decorations section and the Wreath section. 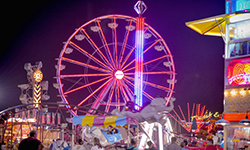 The Flower Show at the Fredericksburg Fair conforms to all rules and regulations of the National Council of State Clubs, Inc. You may enter one or both of the flower shows. See the fair catalog for a complete listing of horticulture rules. Division 1 Horticulture includes: annuals, perennials and biennials, rosa (rose), herbs, bulbs (corms, rhizomes and tubers), hosta, ferns, container grown plants, hanging baskets, ground covers, broad leaf shrubs, needled evergreens, and trained plants. Division 2 covers the artistic design rules. The Farm Products (fruits and vegetables) section is open to all ages. There are 2 sections: 1. Vegetables, Oddities and Herbs, 2. Garden Basket. Under section 1, the following entries are accepted: beets, cabbage, cantaloupes, white corn, yellow corn, cucumbers (pickling), cucumbers (slicing), eggplant, okra, onions, pepper (hot), pepper (sweet), potatoes, pumpkin (biggest), pumpkin (field type), snap beans, squash (yellow), squash (zucchini), tomatoes (red), tomatoes (yellow), tomatoes (roma), tomatoes (salad), watermelon (midget), watermelon (other), decorated potato and unusual plant. The Garden Basket is judged on vegetables, color and presentation. The Photography section is open to all ages. The Sewing/ Needle Crafts category includes Quilting and Spreads, Embroidery and Needlepoint, Knitting and Crocheting, Sewing and Crafts. Crafts are covered under the “Crafts” heading. The Quilting section includes: appliquéd quilt, baby quilt, crazy quilt, patchwork quilt, lap quilt, cross stitch quilt, embroidered quilt, any other quilt not mentioned, junior quilting (ages 7 – 17 years), candle wicking spread, embroidered spread, and any other spread not mentioned. The Embroidery and Needlepoint section includes: creative stitchery, any crewel work, cross stitch sample, any needlepoint, counted cross stitch specimen, chicken scratch specimen, embroidery pillow and needlepoint pillow. The Knitting and Crocheting section includes: afghan, baby set, baby sweater, bedspread, handbag, sweater, decorations and any other knitting or crocheting item not mentioned. The Sewing section includes: child’s play outfit, infant/child’s dress, adult dress, tailored garment, apron, vest, adult sport outfit, household article, and any other sewing item not mentioned.